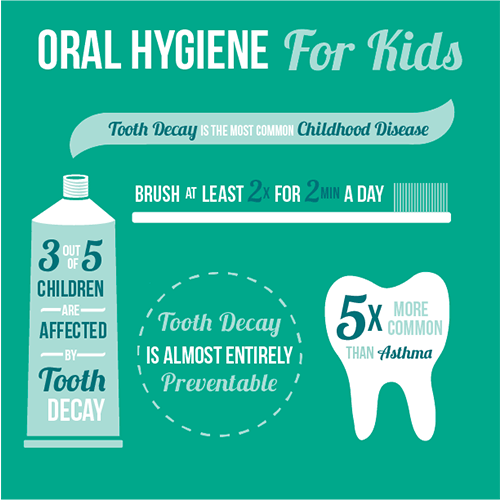 Caring Tree Children’s Dentistry is on a mission to keep kids healthy and smiling. It’s never too soon to start walking the path toward good health. Bacteria – both good and bad – travels from the gums into the bloodstream, so the health of the mouth mirrors the health of the entire body. Preventing cavities and gum disease are important from the very beginning of life. Gum disease and poor dental hygiene not only contribute to lost teeth but have been linked to many systemic diseases in adults. Brushing, flossing, good nutrition, and seeing Dr. K on a regular basis will help strengthen your child’s immunity from an early age. A child’s teeth begin forming in the womb during the first trimester of pregnancy. By the time they are born, 20 primary teeth are poised in the jaw, waiting for the right time to emerge. Good nutrition for Mom helps ensure healthy dental development for baby. Washing your baby’s gums with a soft, clean washcloth after feeding is recommended from birth to help clear away oral bacteria. Teething begins anywhere from 3-9 months of age and can continue until three years old – and every baby is different. While teething can be stressful, it does not cause diarrhea, fever, or runny nose. Extra cuddles, chewing on a cold, wet washcloth, and a little aspirin-free pediatric pain medicine should provide some relief. Once your baby’s first tooth emerges, bring them in to see Dr. Kucera. Beginning a regular oral hygiene routine at home is also essential. Infant toothbrushes and a tiny bit of infant toothpaste are okay to use. Are you wondering exactly how much toothpaste? Once your baby has two or more teeth that touch, careful flossing should also be incorporated into the routine going forward. You should brush and floss your little one’s teeth for them until they are able to do so themselves. This often corresponds with the ability to tie their own shoes (usually around age six). Once your child commands the toothbrush, continue supervision of brushing and flossing until you are confident in their ability to do so alone. (It may help to brush your teeth along with your child, coaching with cues such as, “Now I’m brushing the very back of my teeth, because bacteria might be playing hide and seek back there.”) To encourage kids to brush for the recommended full two minutes, there are toothbrush timers and phone apps – or you can create your own songs or games, use an hourglass with sand, or even a cooking timer with a bell that rings. Switching up the routine and having some fun never hurts! Poor dental hygiene in childhood can lead to difficulty speaking and eating, infection, pain, and can affect overall appearance and self-esteem. Baby teeth will be gone for good by age 12 or 13, but positive dental hygiene habits formed in childhood can last a lifetime. As your little one becomes not so little, their dental concerns change. Being self-conscious goes hand in hand with adolescence, and teens worry more about having teeth that are straight and white. Teens also want more independence and may resist talking to parents about brushing and flossing. Adolescence can be the most important time for openness and trust with Dr. Kucera, who may be able to reach teens (even when they don’t appear to listen to anyone!). Dr. K will remind them how good oral hygiene leads to attractive teeth, reinforce healthy eating, offer take-home whitening treatment, and – if necessary – refer your teen to an orthodontist for braces. When your teen’s wisdom teeth appear, Dr. K and the Caring Tree team will be ready! Dr. Kucera recommends the use of fluoride toothpaste; she may recommend additional fluoride treatment based on your child’s individual needs. As with any substance, it is possible to get too much fluoride – for example, if your drinking water is fluoridated and your child uses fluoride toothpaste regularly, additional fluoride treatment may be excessive. Dr. K will be happy to provide guidance about fluoride. If your child is active in contact sports, Dr. K recommends a custom mouthguard to protect the teeth, jaw, and head. Inexpensive stock mouthguards at the sporting-goods store are not custom-made, so they don’t fit well, are uncomfortable, and are less likely to be consistently worn when needed. Dr. K can fabricate a custom-fitted mouthguard that will provide the highest level of protection against oral injuries, potential tooth loss and even concussion damage. Dr. Kucera does not construct dental appliances for sleep apnea, but she does screen kids for sleep apnea and will provide a referral to a trusted colleague who can help your child with this issue. Even with the most vigilant efforts at oral hygiene, there may be places in your child’s mouth that toothbrushes cannot quite reach. Food particles may get stuck and remain for long periods of time, which, when combined with bacteria, creates the ideal environment for cavities to grow. Sealants are thin coatings of plastic applied to the chewing surface of your child’s back teeth. By covering the pits and grooves where cavities are most likely to form, sealants decrease the likelihood of cavity development. Sealants typically last an average of three years. The recommendation of sealants usually corresponds with formation of first and second permanent molars (ages 6 years and 12 years, respectively). If Dr. K recommends sealants for your child, she will discuss them thoroughly with you. If you have any questions about general dentistry or would like to schedule an appointment with your pediatric general dentist, Dr. Michelle Kucera at Caring Tree Children’s Dentistry, request an appointment at one of our locations below. How can we help your child smile today?